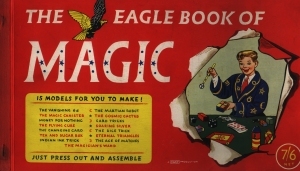 The Eagle Book of Magic is certainly one of the rarer book from the range of Eagle books. It has 15 press out and assemble models for the young magician to make. So, finding a copy with all the models intact would be extremely rare. My copy has several pressed out so is incomplete, but is still, nevertheless, a really interesting read. Had I received a copy of this when I was young, I would have been jumping for joy ! Dimensions : 37cm x 21.5cm with 28 pages. Money for Nothing - could do with this now ! Lost for words ? This book even suggests the patter. To succeed as a conjurer you need dexterity, dexterity, DEXTERITY.